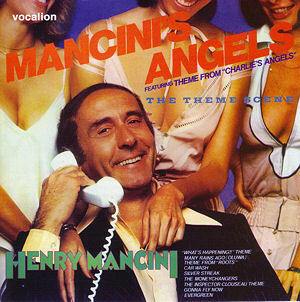 This new release is an amalgamation of the music from two former LPs: ‘Mancini’s Angels’ and ‘Henry Mancini – The Theme Scene’ both recorded for RCA and dating from the late 1970s. They feature Mancini’s high-spirited, idiosyncratic takes on some favourite TV and film themes of those times; many written by other composers – as shown in brackets in the titles listing above. Charlie’s Angels (recorded in 1977) kicks off in high spirits with Mancini’s pulsating paraphrase of the theme from that TV series. This first track is in a very modern idiom featuring an array of electronic synths. Synths play a more minor part in Mancini’s typically relaxed romanticism for ‘Evergreen’ the smash-hit, beautiful love song for A Star is Born. The track features Hank, himself, on piano. Hot jazz featuring bass guitar, organ and guitar solos livens the anarchic humour of Car Wash. 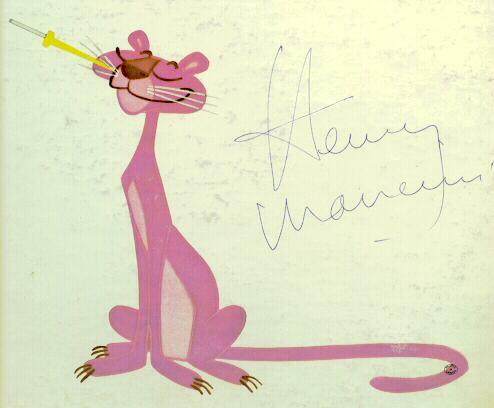 The tripping melody that is ‘The Inspector Clouseau Theme’ for The Pink Panther Strikes Back persists in the memory as does the ingenious, persistently- repetitive, train-like rhythms for the comedy-thriller Silver Streak. What’s Happening returns to the anarchic with the jaunty upbeat jazz and The Moneychangers is another jazzy theme resplendent with strident trumpet solo for the tensely dramatic TV series revolving around dark bank ‘business’. Electronic piano magic and choral vocals heighten Gonna Fly Now. This album ended with striking music from the TV film Roots that chronicled the history of slavery. Quincy Jones and Gerald Fried’s music is beautifully crafted by Mancini into an emotionally moving suite that incorporates both the title theme and ‘Many Rains Ago’ (‘Oluwa’) blending conventional western romance with ethnic styles and instrumentation. The second album from 1978 begins with another sci-fi score and another mix of synths and electronic guitars (get that other-worldy jazz!) plus strident brass for Battleship Galactica. In the same mood, is the upbeat rendering of the famous Star Trek theme but served up with the lush Mancini treatment. Closely allied in treatment with instrumentation wondering across the sound stage is Mancini’s ‘NBC Nightly News theme’. Moody menacing Latin rhythms follow for The Children of Sanchez with chorus filling in the storyline. Dave Grusin’s scores graced many films, often for Paramount, during that era and he is represented by the cheeky perkiness of the theme for Heaven Can Wait. Laurence Rosenthal’s exotic music for the far-fetched storylines of Fantasy Island gives Mancini the opportunity to mix his chorus with steel drums and other exoticisms. The Cheap Detective’s slinky score by Patrick (not John) Williams is full of whimsy with a beguiling trumpet solo and honky-tonk piano. Three’s Company is up-beat, happy and jazzy, a most appealing track with a real cool flute solo. From Little House on the Prairie comes the more relaxed nostalgic title theme with a glowing horn solo quietly accompanied by guitar and strings before another sylvan flute solo. The Album concludes with Mancini’s romantic theme for Once is Not Enough with chorus and ARP synthesiser.